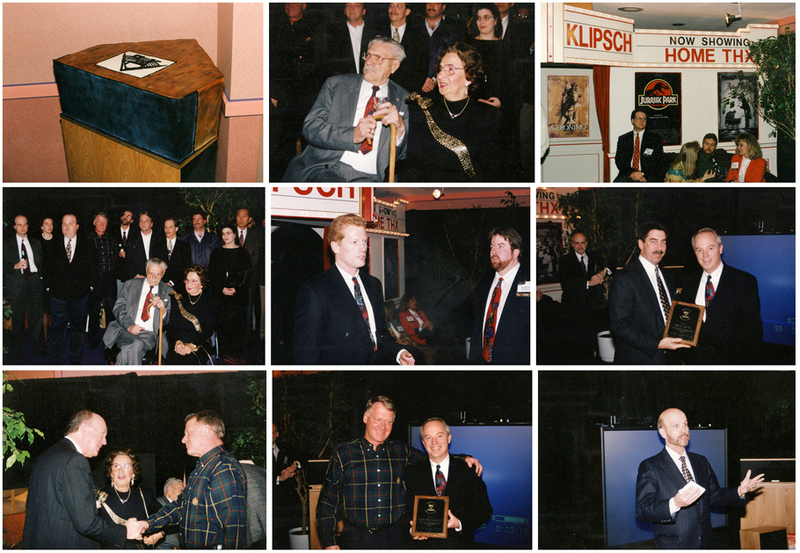 The company took the opportunity to celebrate PWK’s 90th birthday at the 1994 Consumer Electronic Show (CES) in Las Vegas. This was a few months before his actual birthday of March 9th, but it made for an outstanding event. At that time Klipsch did not display on the CES show floor. Rather, they rented ballroom space at the now-defunct Crown Plaza. Limousines were hired to shuttle dealers to a much more private and extensive display of the products. This particular year it facilitated a huge party for PWK. Naturally many industry notables would “be in town” and were invited to attend. See if you recognize any in the photos. Some of the Klipsch Museum of Audio History artifacts were brought and displayed. Of note, the 13th Klipschorn was operating, powered by an immaculately restored Brooke 10 watt amp and preamp (Model 12). The K-horn woofer cabinet was one of the Baldwin-built units with its original drivers, including a Western Electric 713 HF. This is also the one reviewed by Consumer’s Research in 1948, establishing the 1st K-horn review. Program material that evening consisted of Bell Telephone stereophonic recordings from the 1930’s. Most witnesses were impressed with the performance. View all the pictures from this event here.